After a summer driving from Calais to Portugal I found myself not heading to home but on a short adventure to Wales. 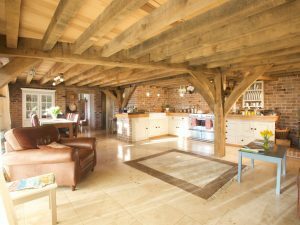 Don had been asked by Carpenter Oak to help out fellow timber framer Paul Thomas. Paul had been left short staffed as his colleague had broken his foot when accidentally dropping a lump of oak on it. Free of family and home constraints, we were able to move location easily, my only issue was a source of income, my solution: peg making. 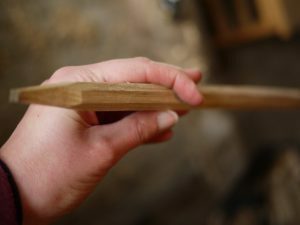 The humble peg plays a vital role in the art of timber framing. 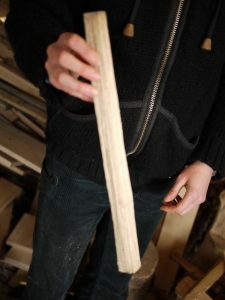 Although they may look insignificant, small in comparison to the frame and sometimes hidden, they are the piece that draw the frame together and keep the joints tight. Carpenter Oak uses octagonal cleft tapered pegs, these are driven into offset holes in the mortise and tenon. 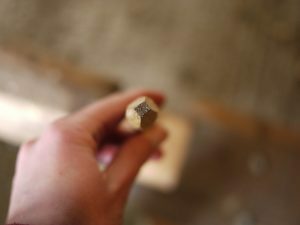 The pegs are octagonal in shape, as a round peg would grip too tightly and not move through the offset holes. 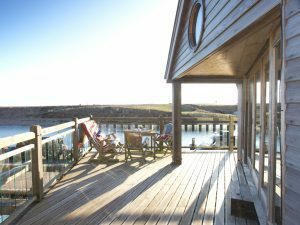 The holes are offset to keep the joint tight as the timber frame dries, minimising movement and therefore gaps in the joints. It is by no means an easy feat to produce a peg. In my first week it took me all day to make twenty pegs, my first day I probably managed ten usable pegs and many tears of frustration. At 80p per peg (in 2005) this was not going to be an efficient way to make money. Faced with going home I made the decision not to be beaten by a peg. By the end of my time I was producing forty in half a day, still not a great achievement but with low living costs it was enough. I would have done more but after half a day my little fingers started dislocating at the knuckles, I must have had a poor technique. 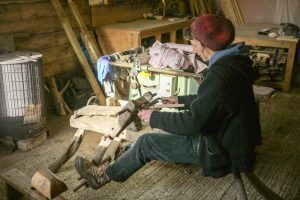 Ex professional peg maker Astrid of Touch Wood South West, revealed that whilst the process of making the peg is relatively uncomplicated, in reality it’s quite difficult. The practice and hand eye coordination, married with the speed needed is far from easy. 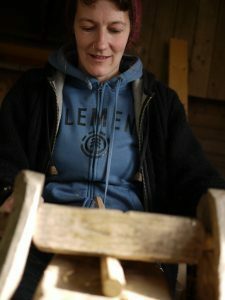 Astrid had various people work with her, one man, a gifted bowl turner and spoon maker, another a lady who had no previous carpentry skills. It takes a lot of practice to deliver the speed that is needed to make peg making a viable income. Astrid herself managed to make an impressive forty pegs an hour out of carefully selected wood! Her ability to achieve this was attributed to her persistence at improving her speed. Like an athlete improving on their personal best, Astrid would set a timer and try to improve upon the time it took to make the previous peg. If you are wondering why pegs are not produced by a machine it is because at present there is no machine able to produce this style of peg. Octagonal and tapered in their shape they are not easy for a machine to replicate. 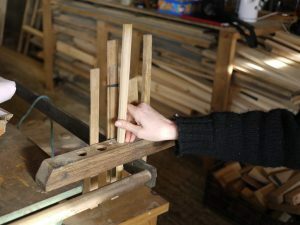 A machine is able to make a round un-tapered dowel and maybe the octagonal shape could be reproduced but octagonal and tapered is more difficult. It is crucial that the pegs are split out with the grain, you could saw them all up but you would have short grain, leaving the pegs weak and prone to breaking. 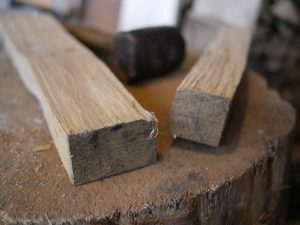 In short, the process of making a peg involves first splitting the blanks from a block of oak using a froe. 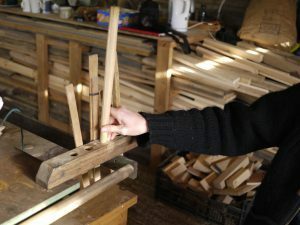 Clamping your peg in a shaving horse, using a draw knife you proceed to make the peg square and tapered in shape, next the corners are removed to create the octagonal form. 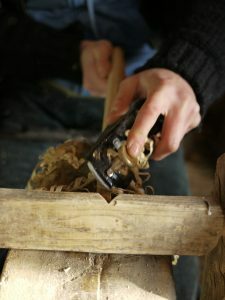 Alongside the drawknife, some carpenters use a small hand plane, so as not to remove too much wood. The important part is to get the peg to the correct size. 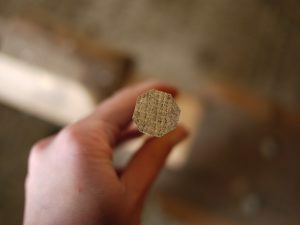 Most carpenters use a home-made hole tester to check the width and length of each peg. It is important to allow for shrinkage, the fatter end of the tapered peg dries at a different rate to the thinner end affecting how far the peg drops through the hole. Once dry the pegs are re-measured to check they are still the correct size, those that have shrunk to much are discarded. The process of peg making requires 100% concentration, daydreaming can slow the critical pace of peg making. 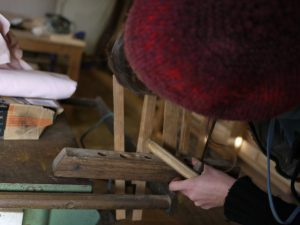 The peg maker is required to be very much in the moment, this necessitates the thinking brain to be fully immersed and focused in the process, and for some it is this act of mindfulness that draws them to the craft, everyday worries don’t exist in that moment. 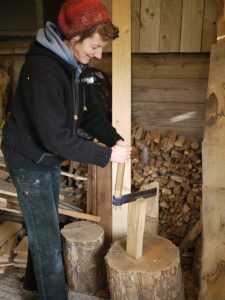 Carpenter Oak source their pegs from several independent suppliers and for many years from woodland products business Coyle Timber. 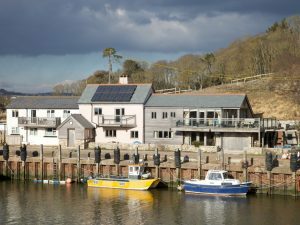 If you were wondering where my pegs ended up, I’m happy to say they are helping to hold together the frame of this beautiful home in Axmouth.